Connects any LCD/plasma HDTV or flat panel monitors with VGA video port to computers with Mini DisplayPort including Apple/Mac and PC/Windows. 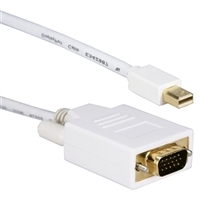 This conversion video cable eliminates the need for a separate Mini DisplayPort to VGA adaptor. Its thumbscrews on VGA connector provides secure connection. Compatible with ThunderBolt, support HDTV's 1080p and screen resolution up to WUXGA (1920x1200). DisplayPort v1.1, HDCP and DPCP compliant.